Click to viewSony Computer Entertainment Japan has just announced a Bluetooth wireless headset for the PS3 — which we previously covered. 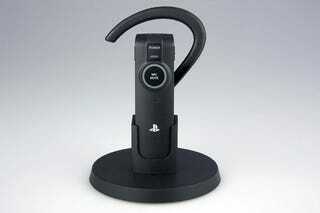 The headset is priced at ¥5,000 (US$46) and will be released in Japan on October 30th. It is bundled with a cradle that can be used to charge the headset, and the headset offers up to 8 hours of talk time and up to 300 hours of standby. It has an operating range of up to approximately 10 meters — or roughly 33 feet. Hit the jump for the press release.SONY COMPUTER ENTERTAINMENT JAPAN TO RELEASE NEW WIRELESS HEADSET FOR PLAYSTATION®3 Bluetooth® Supported Wireless Headset to Enjoy Voice Chat on PS3® Tokyo, September 2, 2008 – Sony Computer Entertainment Japan (SCEJ), a division of Sony Computer Entertainment Inc. responsible for business operations in Japan, today announced that it would release Bluetooth® installed Wireless Headset for PLAYSTATION®3 (PS3®) on October 30th, 2008, in Japan at a recommended retail price of 5,000 yen (including tax). With this new Wireless Headset, users will be able to enjoy the most immersive on-line communication on new software titles supporting on-line chat feature, such as SOCOM: CONFRONTATION*1 available on October 30th, Resistance™ 2 available on November 13th, and MotorStorm™: Pacific Rift available this autumn, all from Sony Computer Entertainment Worldwide Studios. Offering simple operation and accessible voice chat on PS3, this sleek and compact Wireless Headset is an ear hook type headset, designed to fit either ear. Installed with Bluetooth, it pairs automatically with PS3 by simply using the bundled USB cable. The inner ear phone speaker of the new Headset along with the noise cancelling feature when in High Quality mode delivers stable, superior sound. Additionally, the bundled cradle can be used to charge the battery which will allow maximum of eight hours of voice chat when fully charged. While the Headset is connected to PS3, it will support on-screen indicator showing the headset connection status, battery charge level, and other things like speaker volume level and microphone mute status at a push of a button. SCEJ will continue to further expand the PS3 platform to create a new world of computer entertainment with enhanced line-up of PS3 platform and accessories, along with up coming exciting new titles. *1 SOCOM: CONFRONTATION will be available in three versions: Blu-Ray Disc version (3,800 yen including tax), Blu-Ray Disc version bundled with Wireless Headset (limited edition for 8,000yen including tax), and PLAYSTATION®Store Downloadable version (3,500 yen including tax). This product is on-line action game and users will need broadband network connection in order to enjoy the game. * Users will need to install the latest system software update to use the Wireless Headset.